Firstly, THANK YOU. You guys sent me some great emails full of clever speech advice, and I now feel confident that I’m going to crush it (read: not totally embarrass myself) at my sister’s wedding in a few weeks. You are the best. Secondly, I’m not a vegan. I just thought we should put that on the table. I’m pretty obviously non-vegan, actually, if we take butter and cream into account, which we probably should, considering my affinity for both. Still, there are times and places for the butter and the cream (most times and most places, at least for me), but it’s important to know that those things are not the only things. (If they were, I probably wouldn’t fit into my pants.) Turns out there are other things out there, exciting things, just as rich and creamy as my old friends, but infinitely better for my future cholesterol levels/pants. By “other things,” I mean cashews. Soaked overnight and blended into cashew cream. Have you tried this? You should. It’s the base for this smooth soup and the fantastic Caesar dressing you see before you, and it’s becoming a habit of mine. This recipe came to me from my cousin, Ben. He’s both the kindest and toughest guy you’ll ever meet; he recently completed his second Ironman, so he’s legit. (Like, 2.4 mile swim then 112 mile bike ride then 26.2 mile run legit.) Don’t mess with Ben. Try his salad dressing! 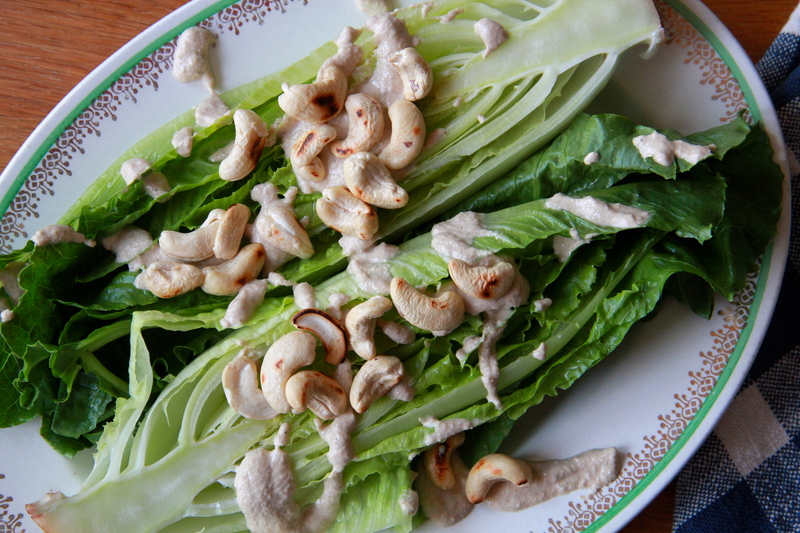 You’ll feel so good about your healthy, cashew creamy Caesar salad that you’ll briefly think about training for a marathon before chuckling at your own insanity and then letting yourself have double the ice cream for dessert. Being a non-vegan vegan is fun. The cashew cream Caesar dressing is so rich and flavorful that you won’t miss the traditional parmesan cheese here, but if you’re a non-vegan and accidentally sprinkle some on top of the waiting romaine, I won’t tell anyone. 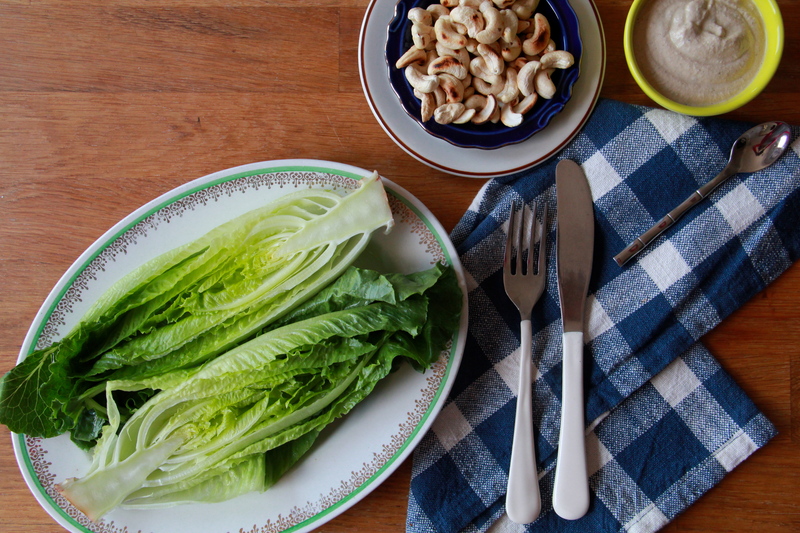 To make the dressing: place cashews in a bowl or tupperware and cover them with at least an inch of water. 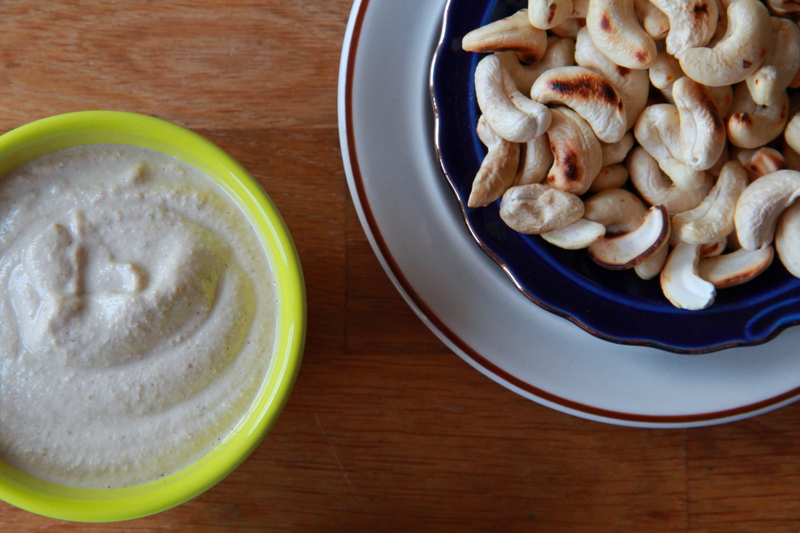 Soak the cashews at least 7 hours, or overnight, then drain them. 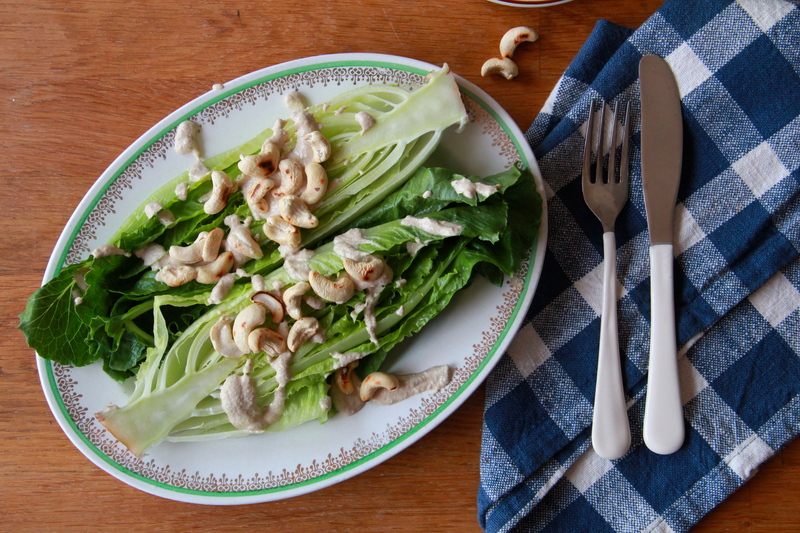 When you’re ready to serve the salad, arrange the hearts of romaine on a plate or platter, and top with caesar dressing and roasted cashews. Serve immediately. What a great idea! This looks delicious. I need this in my life. asap. I’m going to try this over the weekend. Looking forward to seeing you in a few weeks. Your speech will be awesome!